Two dozen local arts ensembles (theater, dance, music, film) are presenting a city-wide Shakespeare celebration this year, and Seattle Opera is on board with Beatrice & Benedict, a frothy number by Hector Berlioz based on the Bard's Much Ado About Nothing. Benedick in English, Benedict in French. There's not enough music to fill even an abbreviated evening, so musical themes by Berlioz were added from The Damnation of Faust, Benvenuto Cellini, and L'enfance du Christ.) Amanda Holden, no relation, did a nifty job of translating Berlioz's saucy French libretto back into English; Jonathan Dean provided original lines for the new music, while ACT Theater's John Langs was called upon to direct the cast in reciting Shakespeare's original lines. Microphones off for the arias and duets, microphones back on for the dialog. It's a recipe for turmoil, with predictable confusion. Singing? Acting? Well, Marvin Grays may be able to recite MLK/s "I Have a Dream" for a one-man show, but was outclassed by the rest of the hapless crew. Hannah Hipp, seen here just last month as the second-cast Dorabella in Così Fan Tutte, tried valiantly to keep up with Andrew Owen, last seen here as a thin-voiced Count Almaviva in The Barber of Seville, but neither was convincing, whether their lines were sung or declaimed. (And I do mean "declaimed;" it's as if no local director had ever attended a performance at the Old Vic, such is their reliance on "loud" and "louder still.") The sweetest singing fell to home-grown soprano Shelly Traverse, as the "second" heroine, Hero, replacing German soprano Laura Tatulescu (Despina in last month's Così) who called in sick. Until this weekend, Ms. Traverse was singing in the chorus; tomorrow, on her dressing room they'll hang a star! Brava! Sad to say, on the other hand, that Ludovic Morlot, the French conductor who's been at the podium of the Seattle Symphony Orchestra for the past five years, seemed to show little initiative in the pit even though he'd put together the score; the performance felt musically aimless. Only the set provided dramatic relief, since it transformed the stage into a multi-level Italian castello. In fact, it looked like one of Piranesi's imaginary prisons, and wasn't new but recycled from I Puritani a full decade ago. Livened up a bit with a few potted plants, of course, because B&B is set in Sicily. So let's give everyone credit for trying something new, for dusting off an old set, for creating costumes that were meant to evoke a "sun-drenched village" in southern Italy (even if the bare-shouldered Beatrice ends up looking like a wanton Mexican peasant). Let's give extra credit for the whole concept of mashing up 17th century Shakespearean wordplay and 19th century romantic musical fragments. The audience won't notice, will they? And if they do, they won't care, will they? 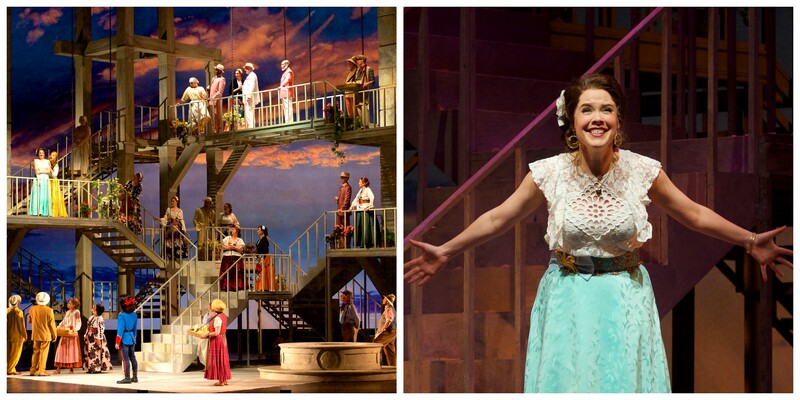 Seattle Opera presents Beatrice & Benedict at McCaw Hall through March 10th. This page contains a single entry by Cornichon published on February 25, 2018 4:00 PM. Idaho's Famous Potatoes Making Way For Idaho Grapes was the previous entry in this blog. Roast Beaver Tail and other uniquely American delicacies is the next entry in this blog.